We have developed curricula on pain medicine and pain physiotherapy accompanying the examinations: the European Diploma in Pain Medicine (EDPM) and the European Diploma in Pain Physiotherapy (EDPP) examinations take place once a year. Further curricula are being developed on nursing and clinical psychology. All physicians working in clinical practice will meet patients suffering with pain. As pain is the main reason why patients visit their general practitioner, all physician need to have basic knowledge regarding the pathophysiology of pain and be able to use at least simple first-line treatments. The establishment of various educational initiatives for practicing physicians has failed to improve the situation for a large proportion of patients suffering with pain. The lack of general pain management education in medical school is considered to be an important reason for this. Contrary to “specialist pain management” which should be limited to those with specific postgraduate training for complex pain syndromes, medical students should be taught “general pain management principles” to prepare them for the majority of patients they will treat with pain. The core curriculum’s goal is not to teach the entire field of pain management but is intended to concentrate on commonly seen pain syndromes and basic treatment options. It is the intention of the authors, that with the implementation of the core curriculum, on completion of their medical education will be able to: identify patients suffering with pain, understand the influence of pain on the patient’s life, methods of analgesia, the most effective pain management approach for each patient, how to classify treatments including non-pharmacological approaches, and how to evaluate their efficacy. The core curriculum will focus on four core pain syndromes: acute post-traumatic resp. postoperative pain, cancer pain, neuropathic pain and chronic non-cancer pain. The authors hope that the core curriculum encourages students and deans alike to be concerned with pain management for the sake of our patients. 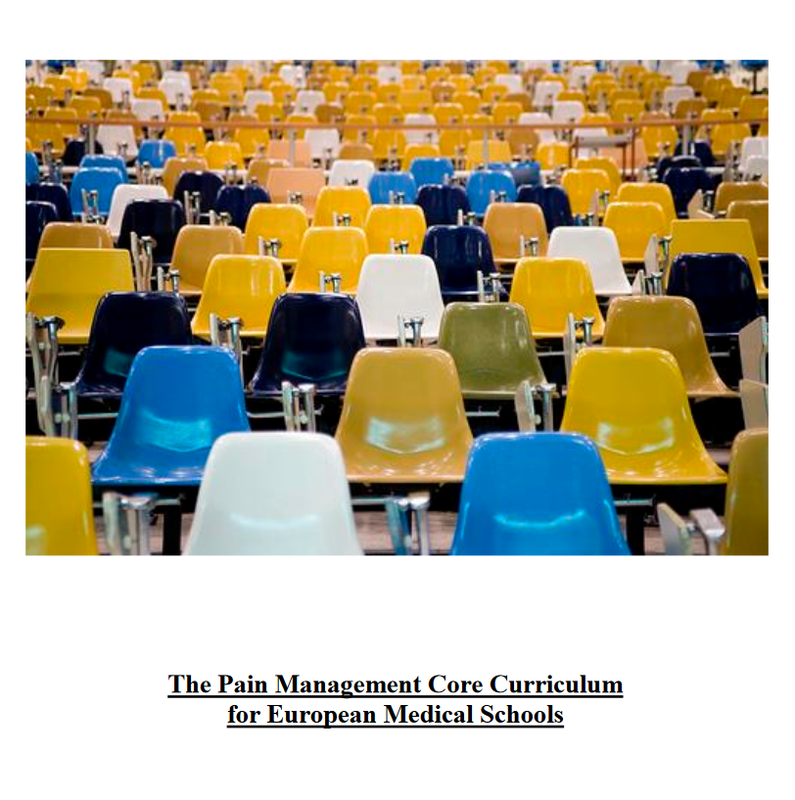 Please find the Core Curriculum for the European Diploma in Pain Medicine here. 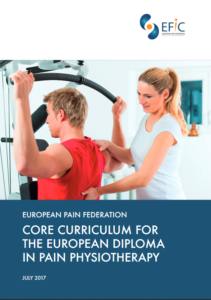 The 2016 curriculum articulates the learning outcomes to be achieved through trainees’ self-directed learning, clinical experience in the workplace and other educational experiences delivered during their training and helped by the EFIC® Pain Schools and educational initiatives. It aims to direct learning in conjunction with an accompanying literature reading list which will form the basis of the Multiple Choice examination Questions (MCQs) used in assessment. Knowledge of the curriculum, pain assessment and treatment skills will be evaluated by a two part examination – an MCQ followed by a series of Objective Structured Clinical Examinations (OSCEs) to test clinical skill performance and competence in modalities such as communication, clinical examination and diagnosis and treatment planning, including referral to colleagues for appropriate management. It is recognized that pain management requires a multidisciplinary approach and no single professional will have all of the necessary training and skills to treat all those across the spectrum of pain. The Diploma is multidisciplinary, for all clinicians across Europe (and beyond, for those interested). Whilst some European countries have their own Diploma or Degree, many do not at this time. Even when an examination is available it is often aimed at one specialty, or even a subsection of that specialty (for example, interventional management).The Diploma aims to show that the Fellow has a firm grounding in the basic skills and knowledge needed to assess and manage the many patients whose pain requires attention in all types of clinical scenario. This curriculum is a dynamic instrument and will be reviewed and updated on a regular basis, sensitive to advances in pain medicine and in medical education and also by feedback from trainees, examiners and Diplomates. We are forever grateful to the Faculty of Pain Medicine of Australia and New Zealand for allowing us to use their current curriculum as a basis for ours. This has been modified to suit the diversity in pre- and post-graduate training in pain medicine across Europe and in line with our desire to cover all factors of relevance to all medical disciplines involved in the assessment and treatment of those in pain. We also thank the many reviewers (listed at the end) who contributed from their professional expertise and time to reviewing and adapting this curriculum for use in Europe. We are especially grateful to the steering committee under the Chairmanship of Andreas Kopf, and logistic support from Ruth Zaslansky. The 2016 curriculum should be read in conjunction with the current recommended reading list which will be found in the European Pain Federation EFIC® website. Please find the Core Curriculum for the European Diploma in Pain Physiotherapy here. Please find the accompanying reading list here. The European Pain Federation (EFIC®) decided to develop its own core curricula and Diplomas in order to better provide up to date pain science knowledge, clinical reasoning and management, as well as to allow the sharing of best practice amongst medical and allied healthcare practitioners. This 2017 Pain Physiotherapy curriculum articulates the learning outcomes to be achieved through physiotherapists’ self-directed learning, clinical experience, educational experiences delivered during their training and professional lives. It should be read in conjunction with the current recommended reading list. Knowledge of the curriculum, pain assessment and treatment skills will be evaluated by a three part examination – a multiple choice examination (MCQ), a practical examination to test clinical skill performance and competence including communication, clinical examination, diagnosis, and clinical reasoning, and a viva. The EDPP is open to all qualified physiotherapists with appropriate clinical experience, who see and treat people with pain. Whilst some European countries have their own Diploma or Degree, many do not at this time. The Diploma aims to show that the Fellow has a firm grounding in the basic skills and knowledge needed to assess and manage the many patients whose pain requires attention in all types of clinical scenarios. This curriculum is a dynamic instrument and will be reviewed and updated on a regular basis, sensitive to advances in physiotherapy research and education, along with feedback from examiners and Diplomates. We are forever grateful to the Faculty of Pain Medicine of Australia and New Zealand for allowing us to use their current curriculum as a basis for ours. It has been modified to suit the diversity in pre- and post-graduate training in both Pain Medicine and now Physiotherapy across Europe, and is in line with our desire to cover all factors of relevance to all physiotherapists involved in the assessment and treatment of those in pain. We also thank the reviewers (listed at the end) who contributed from their professional expertise and time to reviewing and adapting the curricula for use in Europe. We are especially grateful to the steering committee (Catherine Blake, Harriet Wittink, Catherine Doody, An De Groef, Morten Høgh) under the Chairmanship of Brona Fullen.